On the opening day of EVE Online’s annual Alliance Tournament, one team used a clever bluff to secure its first win. 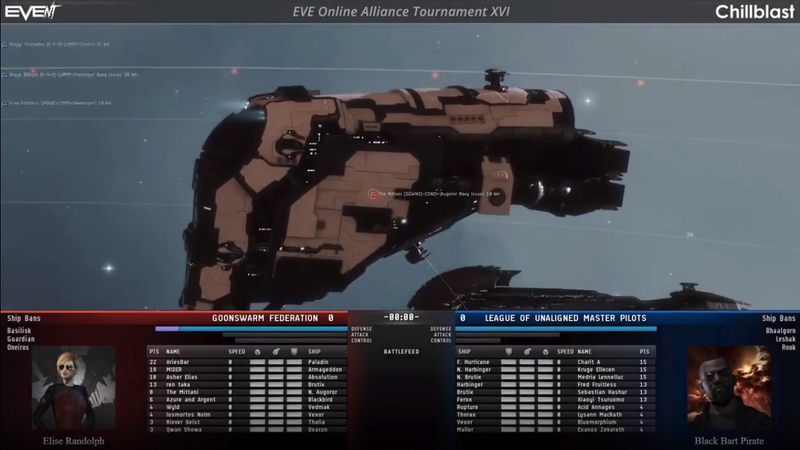 The official once-a-year tournament is unlike all other EVE Online combat, since all competitors start with the same set of equipment. The fights take place on the main EVE server, but in unreachable star systems, to prevent interference. As such, teams can’t win battles based on having accumulated more firepower or players, but instead must out-practice, out-fly, and out-think their opponents. The Goonswarm Federation team brought a surprising player to participate in this year’s tournament: Their leader, EVE Online’s most infamous personality, The Mittani. He is very polarizing figure in the EVE community—beloved by the players who fly under his banner, hated by almost everyone else. As rumors began to circulate that The Mittani would be taking part in the duel, commentators on the Twitch livestream began debating exactly what that would mean for the match. It is a popular belief in most EVE Online circles that The Mittani no longer even actively plays EVE, and instead just manages his empire of tens of thousands of players purely from out-of-game channels. Because of this belief, true or not, whenever he is seen in the game he is a high priority target, with everyone wanting to be able to boast that they’ve killed him. This usually means that his ships are designed around maximum survivability and little else, making him a hard target to take down. Knowing this, the Goonswarm Federation’s team captain Asher Elias asked The Mittani to come along and help institute a bold strategy in the match. The Mittani was assigned a ship well known for being effectively a flying brick—hard to destroy, but with low damage and maneuverability. Seeing this, Goonswarm’s first round opponents LUMPY figured that it was obvious bait: Goonswarm, they thought, was trying to get players to concentrate their fire on The Mittani, for the glory of being able to say they took down the elusive commander in battle, but lose the battle because they’d wasted too many bullets on a ship that wasn’t doing any damage. So instead, they ignored The Mittani and focused on Goonswarm’s support vessels, trying to quickly score some kills and thin out the opposition. Alliance Tournament commentator Elise Randolph pointed out a potential flaw in that strategy, though, noting that it was very likely that Goonswarm could be bluffing. What if, she posited, The Mittani’s vessel was actually equipped with powerful Polarized guns? That would mean that it was actually a very weakly-defended ship that could do massive damage. The Tiamat is an Alliance Tournament prize ship this year. As it turned out, this was exactly what Goonswarm had done, and LUMPY fell for it.The Mittani’s vessel was left almost completely alone for the first half of the match as it dealt out tons of damage with its Polarized weapons. Once he finally came under combined fire from the enemy fleet, The Mittani’s ship was quickly destroyed, but the damage had been done, and the LUMPY team was too far behind to come back, leaving the Goonswarm Federation to win their first match in this year’s tournament. After the match was over, commentators noticed that Goonswarm captain Asher Elias’ ship was also fit with next to no survivability enhancements and Polarized weapons. This means that the two most stand-out targets, the Team Captain and the infamous Alliance Leader, were both completely bluffing with their ship choices. The playoff portion of the tournament will continue for the next two weekends, before the finals begin on Saturday the 18th, with qualifying teams being invited to fly out to Iceland to participate at CCP Games’ headquarters.